DULLES, Va., April 17 /PRNewswire/ -- Orbital Sciences Corporation (NYSE: ORB) today announced its financial results for 2000, reporting consolidated revenues from continuing operations of $725,669,000, down 5% from 1999 comparable revenues of $766,372,000. Orbital's net loss from continuing operations in 2000 was $228,224,000 (or $6.09 per share), compared to a net loss of $105,129,000 (or $2.82 per share) in 1999. The net loss in 2000 included approximately $163,000,000 in non-cash, non-recurring charges, or approximately 71% of the net loss from continuing operations for the year. "While our reported losses for 2000 were very substantial, Orbital actually has made dramatic progress during the past year in strategic refocusing and financial improvement," said Mr. David W. Thompson, Orbital's Chairman and Chief Executive Officer. "During the 12-month period ending this June, the company expects to have completed the divestiture of four non-core businesses to sharpen our strategic focus, raising about $350 million in total proceeds. These funds will allow us to substantially reduce total debt and more than double cash balances compared to a year ago," he added. As a primary part of its financial plan, Orbital yesterday announced that it recently signed a definitive agreement to sell the company's interest in its MacDonald, Dettwiler and Associates Ltd. (MDA) subsidiary for about $163 million. The MDA transaction is expected to address the company's liquidity needs for 2001. "We are confident that implementation of our overall financial plan will enable us to satisfy the company's operating, capital and debt service requirements," Mr. Thompson stated. Certain of the transactions necessary to ensure the company's liquidity through the end of the year, most significantly the sale of the first 12.35 million shares of MDA, had not been finalized as of the release of Orbital's December 31, 2000 consolidated financial statements. As a consequence, the company's outside auditors, PricewaterhouseCoopers LLP, have issued an opinion on the 2000 consolidated financial statements that raises questions with respect to Orbital's ability to continue as a going concern. "While we are disappointed in this decision, we remain convinced that management's financial plans will provide us sufficient liquidity into 2002," Mr. Thompson added. In addition, Orbital indicated that it plans to sell its Magellan Corporation business unit and its interest in Navigation Solutions LLC (NavSol) in the next several months, providing additional liquidity for the company. These strategic divestitures follow the October 2000 sale of the company's Fairchild Defense division for about $100 million and the July 2000 initial public stock offering of MDA in Canada. Related to the company's plan to sell its interest in Magellan and NavSol, Orbital is reporting these two units as discontinued operations for 2000 and prior periods. Orbital's 2000 revenues relating to discontinued operations were $97,311,000 compared to $108,539,000 in 1999 and its losses were $49,966,000 in 2000 compared to $16,808,000 in 1999. Including discontinued operations, Orbital's total loss in 2000 was $278,190,000 (or $7.42 per share) as compared to a loss of $121,937,000 (or $3.27 per share) in 1999. For the full-year 2000 period, Orbital recorded total enterprise revenues (including revenues from unconsolidated subsidiaries and affiliates and discontinued operations) of $869,150,000, compared to $916,414,000 in 1999. Full-year results are summarized in the following table. and a reduction of MDA ownership as compared to 1999. Orbital continued to experience strong demand for its space and ground infrastructure systems in 2000, with $1.2 billion in new contracts awarded to the company, marking the fifth year in a row that the company has received over $1 billion in new orders. Orbital finished 2000 with a total contract backlog of $4.2 billion, of which nearly $950 million was firm backlog and about $3.2 billion was option/pending backlog. Not included in the year-end 2000 backlog totals are two significant satellite contracts that the company was awarded in the first quarter of 2001. In March, PanAmSat Corporation selected the company to build up to three geosynchronous communications satellites for approximately $160 million, while the National Space Program Office of Taiwan awarded the company a $56 million contract to build six remote sensing satellites. Final 2000 total backlog figures were reduced by about $135 million as a result of the October sale of Orbital's Fairchild Defense unit. Orbital reported consolidated revenues for the fourth quarter 2000 of $135,406,000, down 29% as compared to revenues of $191,016,000 for fourth quarter 1999. As discussed below, several one-time items and subsequent events impacted Orbital's fourth quarter results. These items include charges due to NASA's first quarter 2001 decision to terminate for convenience the X-34 rocketplane contract, the decision to dispose of the company's Magellan subsidiary and its interest in NavSol. Orbital's net loss from continuing operations for the fourth quarter of 2000, including the impact of several unusual items, was $52,113,000 (or $1.40 per share), compared to a net loss of $24,899,000 (or $0.67 per share) for the same period in 1999. Including discontinued operations, Orbital's total fourth quarter net loss in 2000 was $88,215,000 (or $2.35 per share) compared to a net loss of $30,136,000 (or $0.81 per share) for the fourth quarter 1999. More details on Orbital's 2000 financial results can be found in the company's 2000 Annual Report on Form 10-K.
"While disappointed in our reported financial results for the fourth quarter and full-year 2000, we believe that we have addressed a number of issues not expected to recur and we look forward to an improved outlook for 2001 and beyond," said Mr. Garrett E. Pierce, Executive Vice President and Chief Financial Officer. 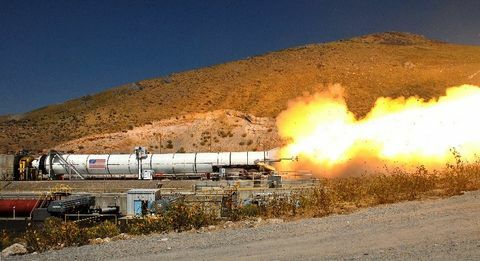 "Additionally, we believe that the pending sale of our MDA subsidiary and the planned sale of our Magellan and NavSol units are further evidence that we are executing on our strategy to improve the company's balance sheet and financial flexibility, while sharpening our focus on and improving the performance of Orbital's core space systems manufacturing business. Our management team is fully committed to returning our basic business to sustainable profitability," he added. As is more fully described in the 2000 Form 10-K, the company's fourth quarter and full-year 2000 financial results include the impact of several non-recurring gains and charges, as summarized below. investment in ORBCOMM and related receivables and inventory. assurance that such a recovery will be successful. Details of Orbital's financial and operational results in each of its business segments are provided below for the fourth quarter and full-year 2000 periods. The company's space and ground infrastructure systems sector generated full-year 2000 revenues of $725,669,000, down 5% from 1999 revenues of $766,372,000. Revenues for the three months ended December 31, 2000, were $135,406,000, down 29% from 1999 revenues of $191,016,000 in the comparable quarter. The revenues for fourth quarter and full-year 2000 discussed above reflect partial-year results from its Fairchild Defense division, which the company sold in October 2000. $19 million write down for X-34 assets and receivables. For the year, Orbital continued its 100% mission success record by conducting a total of 12 space missions, including satellite deployments, rocket launches and space payload operations. 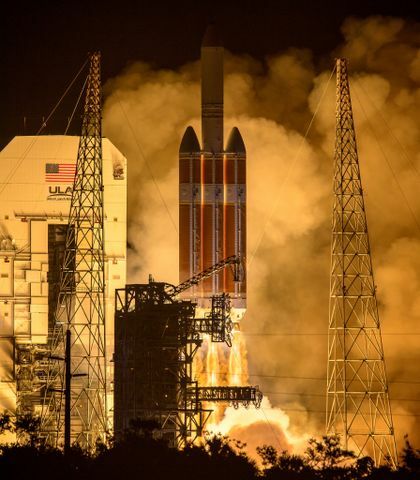 Since its inception in 1982, the company has now conducted over 320 space missions, with an industry-best 101 consecutive successful missions during the 51-month period from January 1997 to March 2001. 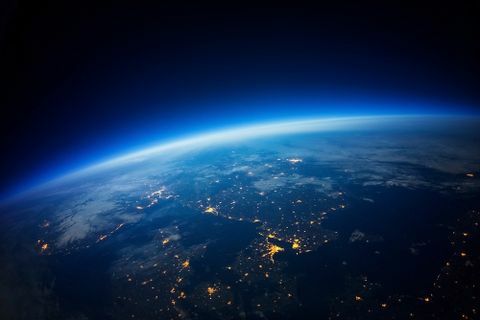 During the fourth quarter of 2000, Orbital received new orders for its space and ground infrastructure systems worth about $260 million, bringing its total new bookings for the year to approximately $1.2 billion. As a result, the company's firm and total contract backlog for its space and ground infrastructure systems were about $950 million and $4.2 billion, respectively, at year-end. As previously stated, Orbital has formally adopted a plan to sell its Magellan business unit and its interest in NavSol and, accordingly, will report the results of its satellite access sector as discontinued operations for 2000 and prior periods. In executing its divestiture plan, Orbital is targeting to close the sale of these units by the end of the second quarter of this year. The satellite services sector consists of ORBIMAGE, ORBCOMM Global L.P., and ORBNAV (NavSol) (which, as described above, is now treated as a discontinued operation). Orbital does not consolidate revenues from these businesses, but uses the equity method of accounting for these investments. The satellite services sector generated total revenues of $46,171,000 in 2000, up 11% over 1999 revenues of $41,503,000. In the fourth quarter, satellite services reported total revenues of $9,922,000, up 24% from the comparable 1999 period. ORBIMAGE generated approximately $5,452,000 of revenues during the fourth quarter of 2000 and $24,123,000 for the full year. These amounts compare to $4,999,000 of revenues in the fourth quarter of 1999 and $18,134,000 for the full 1999 year. NavSol generated approximately $4,305,000 of revenues in the fourth quarter and $14,250,000 for the year, compared to $2,423,000 and $3,140,000 in fourth quarter and full year of 1999. In 2000, the company completed several financial transactions in its ongoing process to address the liquidity needs of the company. In July, MDA completed an initial public stock offering on the Toronto Stock Exchange of 6.6 million shares of common stock, resulting in approximately $18 million in net proceeds to Orbital and a non-recurring gain of $31 million in the third quarter. In October, the company sold its Fairchild Defense electronics business, generating approximately $100 million in gross proceeds and a one-time gain of $42 million in the fourth quarter. As previously stated, Orbital received an opinion from its auditors at the time the company filed its Annual Report for 2000 on Form 10-K, which raises questions regarding the company's ability to continue as a going concern. Orbital believes that it is addressing this liquidity concern by the anticipated closing of two pending non-core business unit sales that are expected to generate approximately $225 million in proceeds. Additionally, the company is continuing to pursue opportunities to make its core operations more efficient in order to improve its cash flow from operations. Orbital expects that these actions will generate sufficient additional liquidity to satisfy the company's capital needs in 2001, including its full operating, investment and debt service requirements. "While 2000 was a financially disappointing year for Orbital and its shareholders, it also produced a refocused business strategy and an improving liquidity outlook for the company. As we look ahead to the remainder of 2001, Orbital's management team is determined to complete our financial turnaround and maximize value in our core space systems business," concluded Mr. Thompson. Such "forward-looking statements" involve unknown risks and uncertainties that may cause the actual results, performance or achievements of the company to be materially different from any future results, performance or achievements, expressed or implied by such forward-looking statements. Factors such as general economic and business conditions, availability of required capital for Orbital and its affiliates, the financial condition of major customers, product performance, market acceptance of products, services and technologies, consumer demand, and dependence upon long-term contracts and licensing agreements with commercial and government customers may impact the company's revenues, expenses and profit from period to period. These factors and others related to the company's business are described in further detail in the company's SEC filings, including its Form 10-K. Orbital assumes no obligation to update any such forward-looking information.